I was recently sent the OCC Sci-Fi Lullabies Lip Tar collection to try out and as soon as I opened the package I KNEW I'd fall in love with Batty, but I had no idea how in love with it I would be. It's AMAZING! 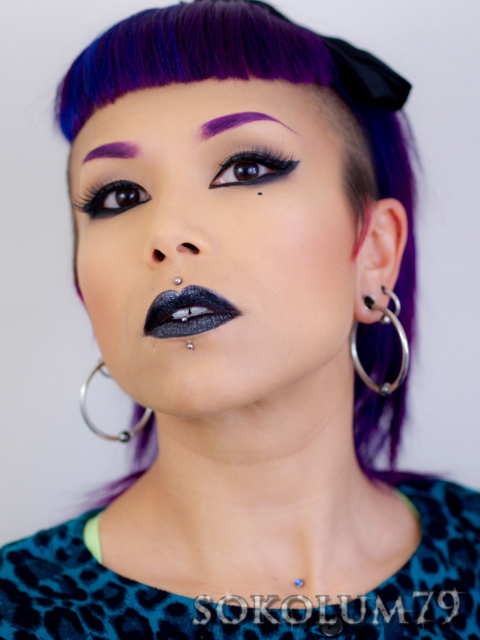 Batty is a black Lip Tar with a silver sparkle to it. I paired it with thick black winged liner and arched purple brow. I also had my fringe reshaped so that it is rounded and angles upwards on the sides. Ann-Marie and I were more pleased with this shape. Now for the elephant in the closet. I am confirming that my eyelets have changed in size. Ha! For the past 6 weeks I have been trying to reach 3/4" by taping my jewelry. However, when I removed the jewelry from my bum ear, my skin stuck to the tape and it removed some of the skin. I messed up and I didn't try put jewelry in my ear until the next day, which was too late and too tight so I just let it be. I was totally stressed about it so I went to see Azl (his blog) at MTL Tattoo I for help. One of his specialities is earlobe reconstruction. He was recommended to me by a stylist at my hair salon. Azl was so professional and made me feel at ease that I didn't totally mess my ear up. He was able to comfortably stretch it to a 0 and said that I should be back to my normal size by the summer because re-stretching goes considerably faster than a new stretch. He was right that it was going to be fast, that was yesterday and today my plug already fell through!